“Ok guys, I have some news. I’m moving back to France at the end of the year. – What about us? What about Fablab Saigon? 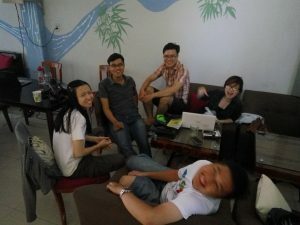 This is the conversation I had with the Fablab Saigon team last September. And in October, Fablab Saigon officially got a new director: Nguyễn Trọng Nhân. If you know about Fablab Saigon, you know about Nhân already. Nhân has been instrumental to most of the achievements of Fablab Saigon in the past 2 years. 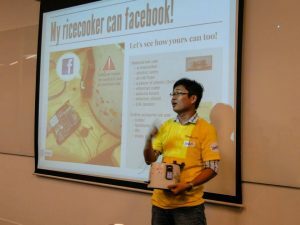 From our very first public presentation “The rice cooker that can facebook” on the Internet of Things at Saigon Tech Camp in March 2014 to the latest Mobile Fablab program in July 2016. Nhân has been our Chief Maker, our first Fabmaster. I am very proud and excited that he accepted to become the new director for Fablab Saigon. It goes without saying that Nhân will not try to be me. It isn’t possible nor desirable. There are things that I was doing that Nhân won’t be doing and there are plenty of other new things that I wasn’t doing that he will be doing as a director. A new director actually creates a new range of opportunities for the organization. 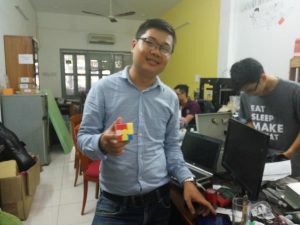 Nhân has clear ambitions for Fablab Saigon on two main activities, STEAM education and prototyping, while still developing and leveraging the makers community with hardwre hackathons and workshops, and maybe more importantly the development of the makerspace. If you come now to Fablab Saigon you’ll notice the evolution since the summer. Nhân graduated in Electrical Computer Engineering from the University of Technology in HCMC, where he also took part in the International students program. He studied for a year in the US, at the University of Illinois at Urbana-Champaign. He had the chance to travel around already, but at the end of the day, Nhân still loves Vietnam best, which may explain why he is so keen on developping innovation “made in Vietnam”. Of course, I hope that the mission and vision of Fablab Saigon remains strong, and also the organization’s culture, because it is an asset that takes time to build. But we have to accept that everything can change, and it is through the people who are part of the organization and their leadership that the purpose and culture of the organization can truthfully express. The organization is shaping itself like a living entity where everyone is unique and therefore contribute in a unique way. People are not interchangeable but the organization adapt to individuals to allow them to be and give their best. As for me, although moving to France, the story continues with the Fablabs Vietnam Network, which I intend to chair. Scaling the first fablab in Vietnam to many fablabs throughout the country has been a dream from the start of Fablab Saigon. Why? Because being alone is no fun! The fablabs are not only a space, a community but also a network. I believe that the fablab values of knowledge sharing, open and grassroot innovation can help Vietnam leapfrog. It is thanks to Nhân accepting to become the new director of Fablab Saigon and the dedication of the Fablab Saigon team and its community of volunteers, that I can move on with serenity. I am very grateful and I wish the team all the best. I hope that everyone will join me in doing so and will continue to support Fablab Saigon for what it stands. Nhân chairing a Fablab Saigon’s team meeting. But what are these happy faces up to?